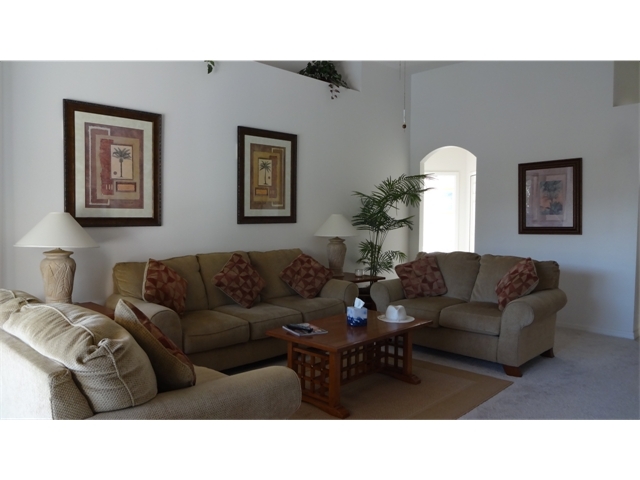 4 bedroom, 3 bathroom villa in the Calabay Parc community. Owned by The Whitley Family. Ref: 818. ELEVATED LOCATION: Unique to Calabay Parc. The rear of the villa faces south with views above the tree line to the south west. You won't feel boxed in like some other vacation homes. Relax and play in your own pool. The extended deck area has plenty of loungers and seating. For your safety, all doors to the pool area are connected to the integrated child alarm to alert you of any little tykes escaping to the pool before you're ready. If required in the cooler months, the pool can be heated for an additional charge. The pool is heated by gas. Eat, snack or even work outside (if you have to). 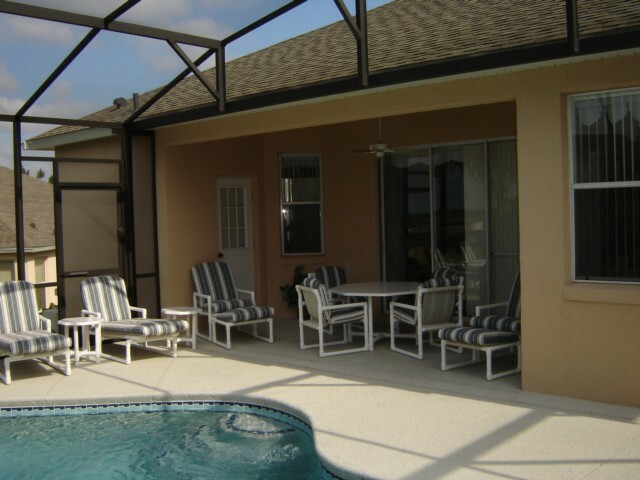 The shaded lanai provides a cooling off area, with ceiling fan to circulate a breeze. 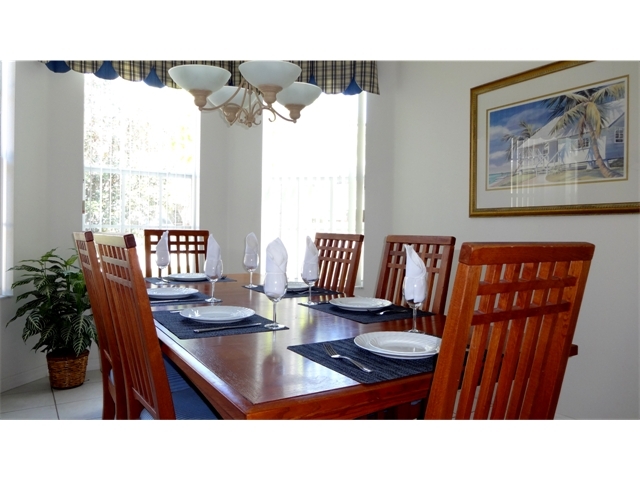 4 BEDROOMS: Sleeps 8 very comfortably. All bedrooms have Smart LCD Digital Cable TV's, large wardrobes and plenty of drawer space. Access the pool area from the two double bedrooms. 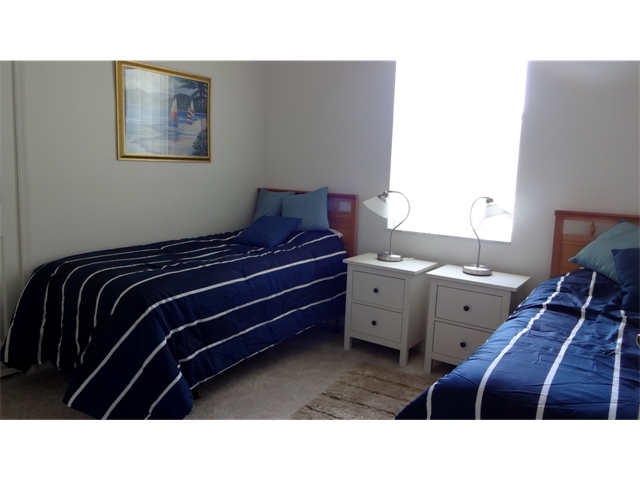 Two en-suites to the double bedrooms and one bathroom shared between twin bedrooms. Master bathroom features a large walk-in shower, a deep tub, twin basins and separate WC. All other bathrooms have bathtub, showers, wash basin and toilet. The guest en-suite is also directly accessible from the pool side. 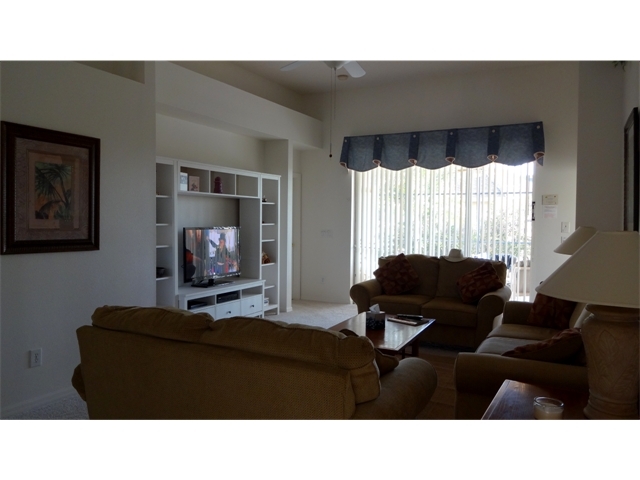 Large HDTV; Digital cable (Brighthouse) with Sports Pass; Blu-ray/DVD Smart TV (for Netflix etc); 3 sofas seat 8 (or 4 sofa bears!). 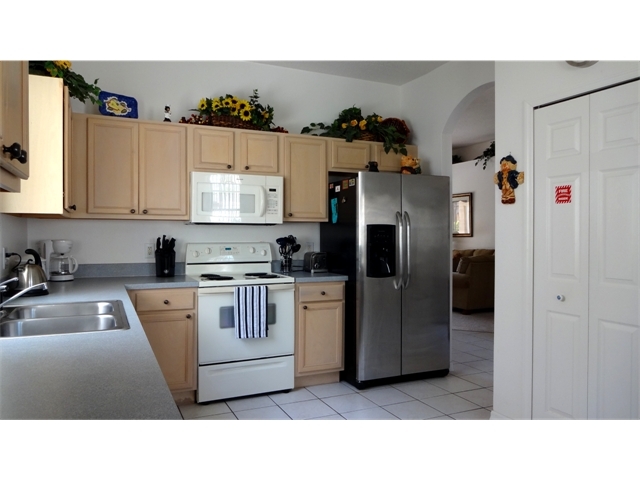 KITCHEN: Fully equipped for your convenience. Stainless steel American style fridge freezer – includes ice and filtered water dispensers; dishwasher; electric oven and hob; built-in microwave; filter coffee machine; blender; slow cooker. 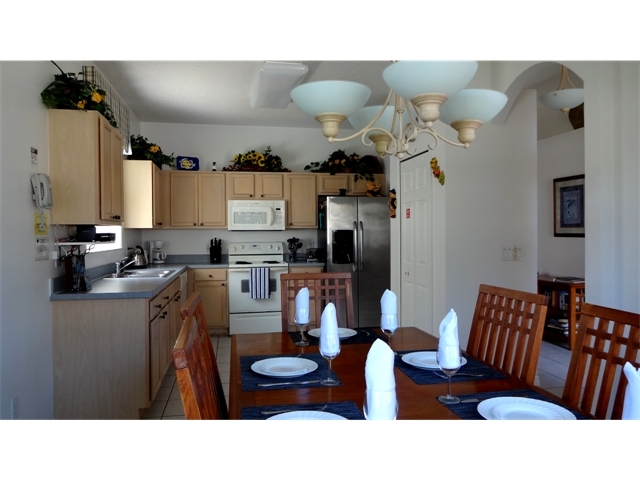 DINING AREA: Formal and casual dining catered for. Family sized dining table. Seats 8 comfortably. Large top-loading washing machine; separate gas powered dryer; ironing board and iron. AIR CONDITIONING: An essential, but worth mentioning. Fully air conditioned throughout. Cool in the warmer months, warm in the cooler ones. AIR HOCKEY & POOL: Shoot some pool. Like many vacation homes, we have reserved the garage for fun. 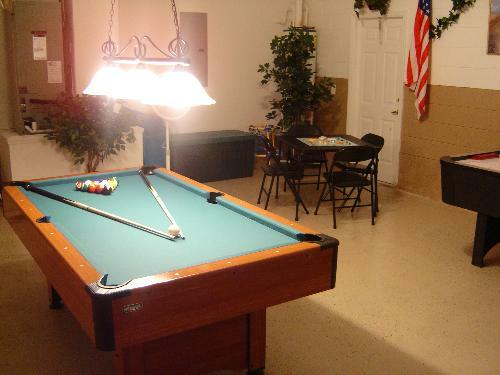 Shoot some pool or play air hockey on the two dedicated tables. DRIVE DIRECT TO THE VILLA: No need to pick-up keys. Drive directly to the villa. FREE INTERNET ACCESS: Stay connected away from home. Secure, free wi-fi and cable internet access for your entire stay. TOWELS: All provided - including pool towels. FREE TELEPHONE CALLS: All calls are free, including international calls. HAIR DRYERS: 3 hair dryers provided. :: 15 minutes from the magic of Walt Disney World. :: 75 minutes from the surf of the Atlantic. 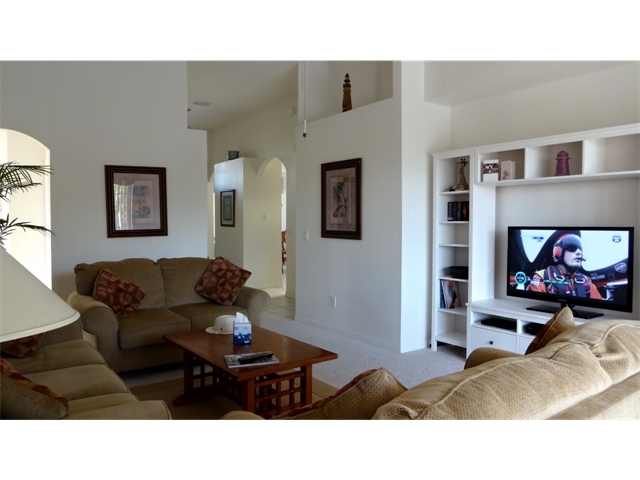 :: 100 minutes from tropical Gulf beaches. 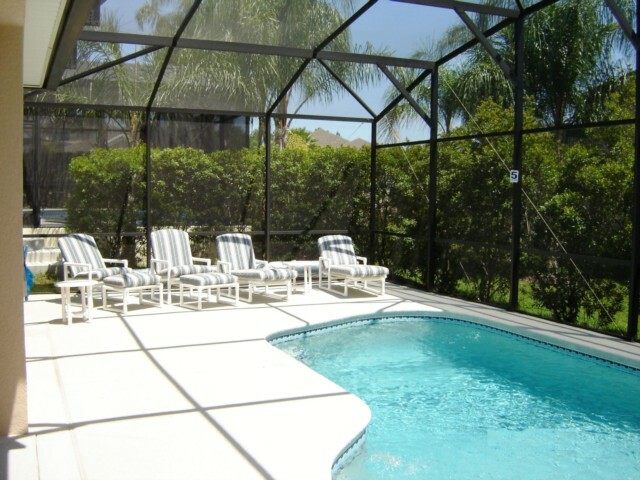 A vacation to your home from home in Florida has just one problem. It'll be too short! 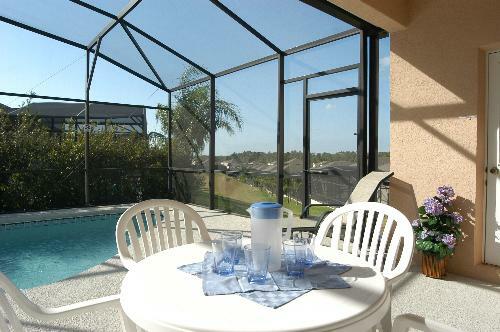 Our 4 bedroom, 3 bathroom detached vacation home with private pool is located in a uniquely elevated, south facing position at Calabay Parc in central Florida and is available to rent throughout the seasons. 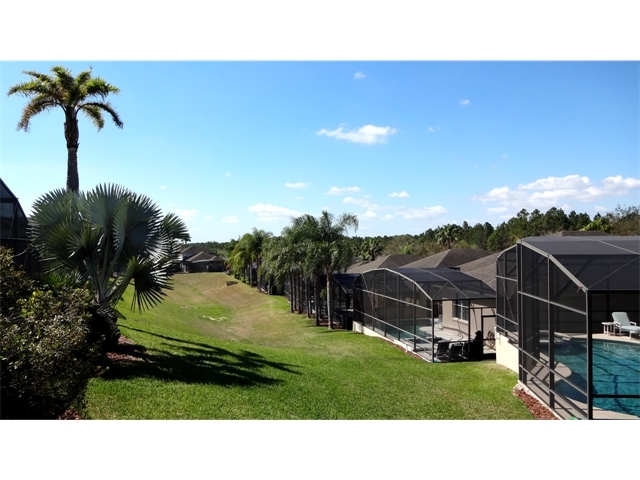 Situated in Polk county, Calabay Parc is a vacation home community consisting of 3 to 5 bedroom privately owned properties. The quiet, winding roads take you through a neighbourhood that enjoys lush communal landscaping, proudly maintained through the Calabay Parc Home Owners Association. 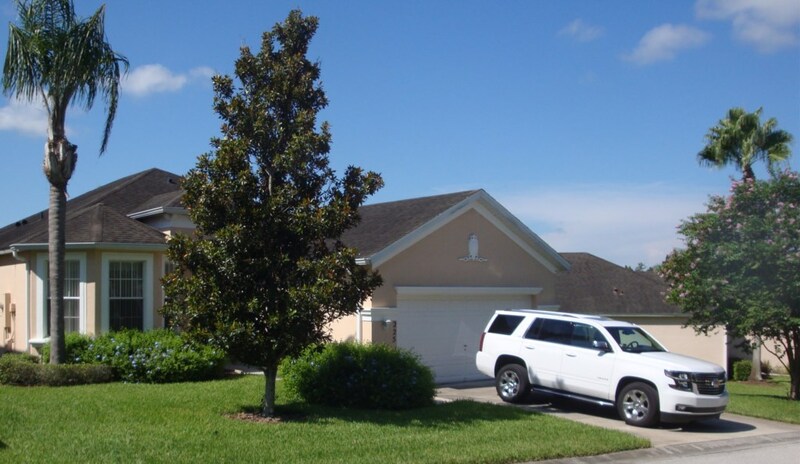 Accessible from US27, Calabay Parc is 3 miles (5 minutes) north from Interstate 4, making connections to all central Florida's attractions quick and easy. Journey time from Orlando International Airport is typically 35 to 40 minutes - close enough to be connected to the world, far enough away to not know it's there. For your security and peace of mind, CCTV is in operation at both entrances and throughout Calabay Parc. CHILDRENS PLAYGROUND: On site there is a tot lot 5 minutes walk away. SUPERMARKETS & PHARMACIES: Only a short drive to Publix supermarkets and CSV at Berry Town Centre (6mins) or at Champions Gate (9mins). Walgreens is close by (5mins) and Target, with several other stores, can be found at Posner Park (10mins). IMAX CINEMA: New for 2015, Posner Park is now home to a fabulous Cinépolis Imax ™ movie theatre. Just 10 minutes drive away. MEDICAL: The Heart of Florida regional medical center is 11mins drive south on US27. GOLF: We are very fortunate to have Champions Gate on our doorstep. Take your pick from two of the best golf courses in Orlando: The Greg Norman International or National courses. Our management company play these courses weekly and will be very pleased to discuss rates and your requirements. Faster food: McDonalds, Wendy's, Subway and others are also around the same vicinity. Fish & Chips, Chinese and Indian take-out's too. Contact us today for a competitive rate that will help make your dream vacation a reality! 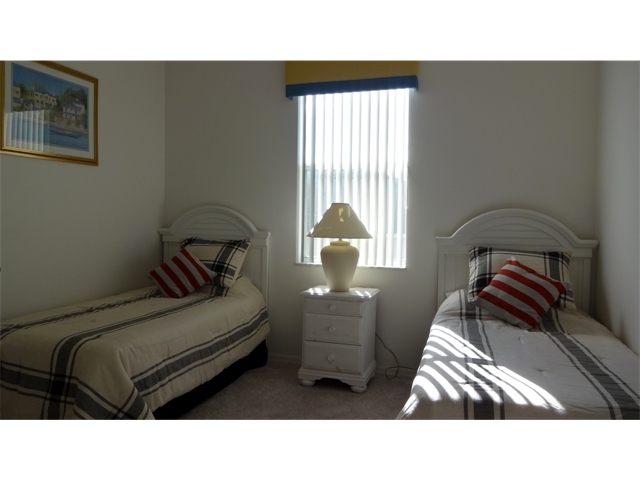 Low season prices from $770.00 per week. 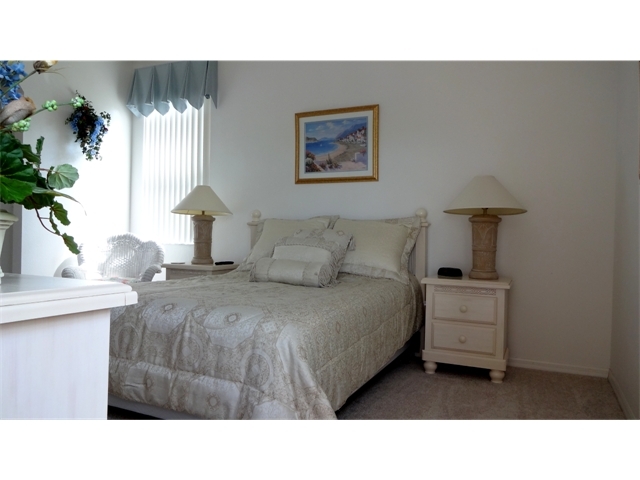 Peak season prices from $995.00 per week. Prices quoted are for the rental of the property for a 1 week/7 night period and exclude taxes. 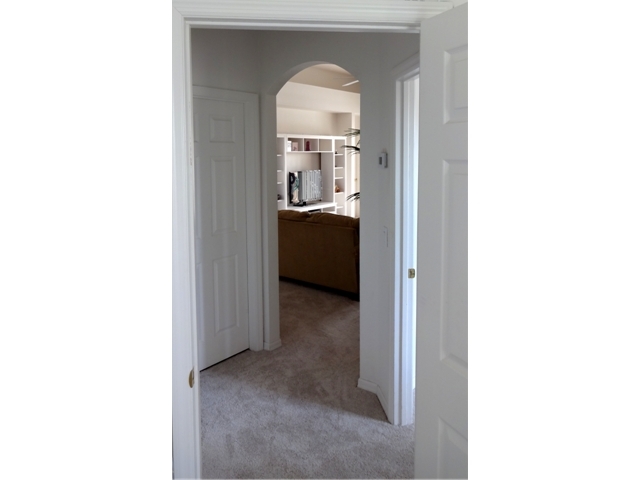 We will be happy to discuss your specific requirements and work on a rate for you. 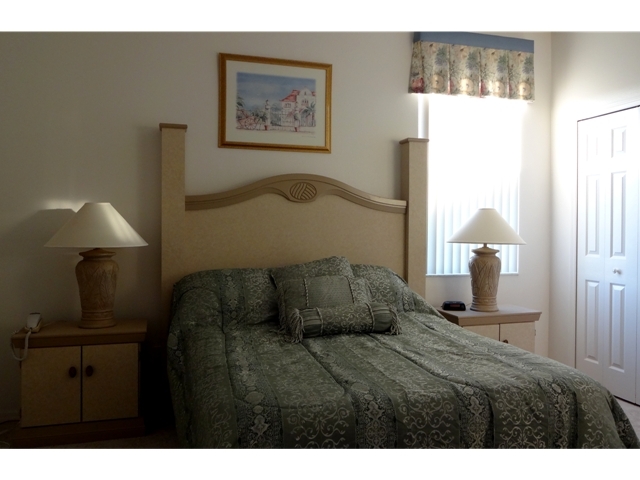 We apply discounted rates to meet requirements for stays longer than 21 days. A clean fee of $95 will apply for rentals of less than 7 nights. A Booking Deposit of $250/£200 will be required at the time of reservation, with payment in full 8 weeks before your first nights stay. Your Booking Deposit will be deducted from your final bill. A refundable Security Deposit of $250/£200 will be required 3 weeks before arrival. This will be returned in full no less than 2 weeks after your stay if our management company confirm there has been no damage to the property. During the cooler months, typically October through April, the pool can be heated. An additional fee of $125 per week for a minimum of 7 days applies. This will be applied to your reservation quote and final bill if you request for heat at the time of making your booking. If you have not pre-booked pool heat and decide during your vacation to have the heat switched on, you can pay our management company directly and call them to request activation. However, this will incur an additional call-out fee. Your enquiry will be sent to villa ref 818 only. This page has been viewed 35650 times since 06 Aug 2003.